“Be snowball! Squish the zombies!”. Probably the clearest description of a game I’ve ever seen. 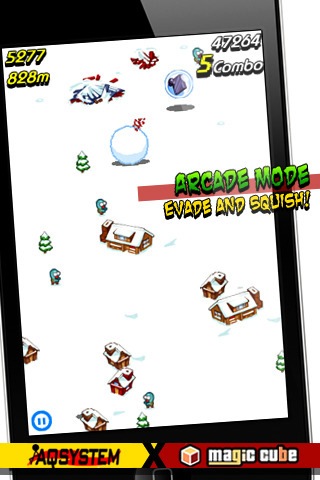 Like the AppStore quote, Squish the Zombies is a snowball rolling down a hill. You will run across zombies that you kill to make your snowball grow larger and faster. Trees will lower your size and house can knock off huge amounts of snow but launch you into the air to land on other houses, trees, or zombies and get points for the crushing jump. If your snowball ever reduces to nothing, you lose and have to try again. This game is Openfeint compatible and you can post your highscores to Twitter and Facebook. Released by AQSystem and MagicCube, Squish the Zombie is available for $0.99 on the iPhone, iPod touch, and iPad. Let me start off by stating that I LOVE zombies. The movies, the comics, the games, I love them so. I am very much a fan of the original Romero films, I’ve seen Shaun of the Dead and Dawn of the Dead (remake) about 20 times each, and I own the Zombie Survival Guide book. With that, I can say that these are arguably the cutest Zombies I’ve ever seen. 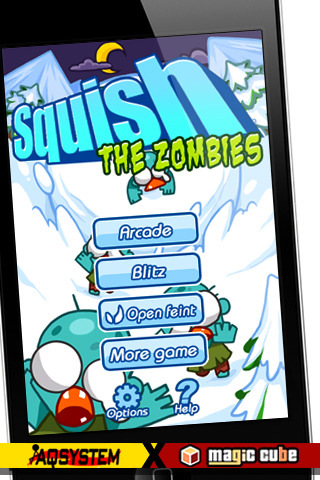 Squish the Zombies features two modes: Arcade mode and Blitz mode. Arcade Mode is a distance game. You just tilt the iDevice to steer the snowball and try to squash zombies and only zombies. Trees, buildings, and random powerups litter the mountain so you have to steer carefully to rack up the zombie-kill combo and reach the highest score and distance records. Blitz mode is my personal favorite mode. Here, you have nothing in the way except zombies. You roll over a legion of pacing zombies to grow to ridiculous sizes and crush the zombies. The goal is to squish up to 400 zombies in one minute. It’s tough, it’s fun, and the little tiny zombies are adorable. I am definitely happy with Squish the Zombie, but I feel there could be so much more. Maybe fat zombies that launch you into the air when you hit them but still make your snowball larger and faster? Maybe snowmobiles could be in the way that act like moving trees? I would love to see the white snow background change a bit with some cliffs that causes your ball to fall from high areas with mountain textures to break up the constant snow and maybe a soundtrack to go with it? Squishing these Zombies was a fun experience and was just violent enough to warrant the use of zombies. I’m addicted to Blitz mode and can’t wait till I finally hit 400 (the closest I got was 352…). With more improvements, I can definitely say that this is a great success. Great job AQSystem and MagicCube! You let me ‘be snowball’ and I appreciate it greatly. AppSafari review of Squish The Zombies was written by Joseph Ho on September 27th, 2010 and categorized under Action, App Store, Featured, Fun, Games. Page viewed 4196 times, 1 so far today. Need help on using these apps? Please read the Help Page.